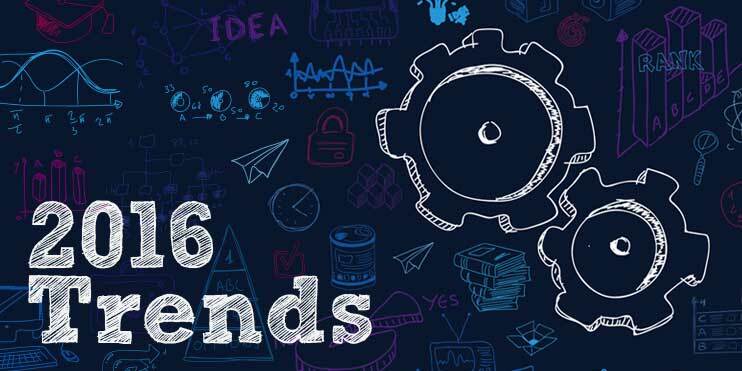 At the beginning of every year we spend time analyzing technology trends to ensure that we keep our skillset sharp and our clients informed. These are the top five technologies that grabbed our attention and that are going to make a difference in the years to come. As everyday objects are going online (thermostats, door lockers, security, scales, lights, etc. ), so too are experiences—creating an abundance of digital channels that reach deep into every aspect of individuals’ lives. Forward-thinking businesses are changing the ways they build new applications, products, and services. To gain control over these points of access, they are creating highly personalized experiences that engage and exhilarate consumers without breaching their trust. The companies that succeed in this new ’Internet of Me’ will become the next generation of household names. The device mesh refers to an expanding set of devices/sensors people use to access applications and information or interact with people, social communities, governments and businesses. The device mesh includes mobile devices, wearable, consumer and home electronic devices, automotive devices and environmental devices — such as sensors in the IoT. While devices are increasingly connected to back-end systems through various networks, they are often operated in isolation from one another. Lately this is changing and more and more various devices are connecting and cooperating. Everything in the digital mesh produces, uses and transmits information. This information goes beyond textual, audio and video information to include sensory and contextual information. Information of everything addresses this influx with strategies and technologies to link data from all these different data sources. Information has always existed everywhere but has often been isolated, incomplete, unavailable or unintelligible. Advances in semantic tools such as graph databases as well as other emerging data classification and information analysis techniques will bring meaning to the often chaotic and overwhelming amount of information. In advanced machine learning, deep learning, artificially intelligent computers are now capable of deep learning using neural networks, which you can think of as brain-inspired systems capable of translating pixels into English. Deep neural nets move beyond classic computing and information management to create systems that can autonomously learn to perceive the world, on their own. For example IBM Watson. The explosion of data sources and complexity of information makes manual classification and analysis infeasible and uneconomic. Deep neural nets automate these tasks and make it possible to address key challenges related to the information of everything trend. Deep neural nets (an advanced form of machine learning particularly applicable to large, complex datasets) is what makes smart machines appear "intelligent." Deep neural nets enable hardware or software based machines to learn for themselves all the features in their environment, from the finest details to broad sweeping abstract classes of content. This area is evolving quickly, and organizations must assess how they can apply these technologies to gain competitive advantage. Toward the end of 2014, Google researchers unveiled a new project that uses neural networks and deep learning to identify multiple elements of a scene without human assistance. Its software “learned” how to think by processing vast quantities of data. For example, deep learning will eventually allow robots to recognize objects they haven’t seen before and navigate to new locations on their own. Deep learning intersects with numerous fields, and it will soon aid in manufacturing, medicine, retail, utilities, and beyond. Machine learning gives rise to a spectrum of smart machine implementations — including robots, autonomous vehicles, virtual personal assistants and smart advisors — that act in an autonomous (or at least semiautonomous) manner. While advances in physical smart machines such as robots get a great deal of attention, the software-based smart machines have a more near-term and broader impact. Virtual personal assistants such as Google Now, Microsoft's Cortana and Apple's Siri are becoming smarter and are precursors to autonomous agents. The emerging notion of assistance feeds into the ambient user experience in which an autonomous agent becomes the main user interface. Instead of interacting with menus, forms and buttons on a smartphone, the user speaks to an app, which is really an intelligent agent.